T-72, a classic of Soviet design. Noted small curved turret, steeply sloped chassis and turret surfaces, utilization of ERA tiles over tank surface, wide broadly spaced tracks and generally simple design which is quick and inexpensive to build. 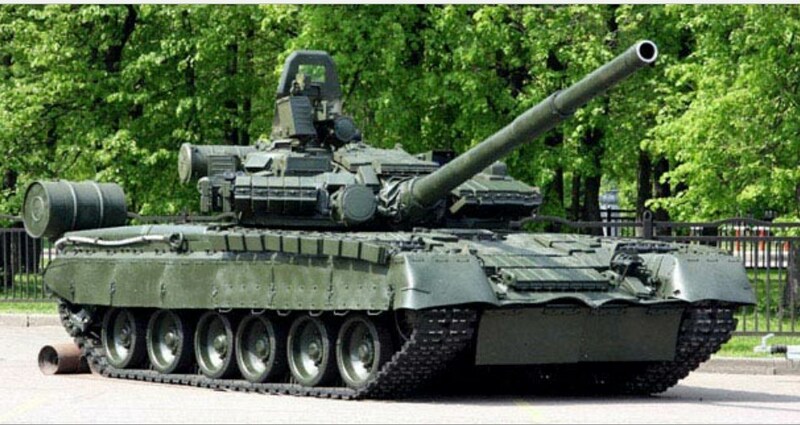 The T-72 is an example of classic Soviet/Russian MBT design. The trademark feature of the T-72, as with many Soviet tanks, is the small rounded turret. These were made of cast armored steel until fairly recently. Though Western designers complain that the small turret size produces very cramped working conditions for the crew the design is effective in reducing target cross-section and increasing surface obliquity to incoming threats (curved surfaces are intrinsically of a high obliquity as they induce rotation of the threat on impact). Modern Soviet/Russian turrets also include auto-loaders, an approach not taken by many Western armor designers. The auto-loader decreases the necessary crew members by one, reducing overall vehicle weight, and in theory increases the firing rate of the weapon. Jams however are more frequently and difficult to correct, and loading becomes very slow once the ready rounds are consumed. Because of the smaller turret size and auto-loader, available ready rounds are significantly reduced compared to Western designed vehicles. The Soviets originally did not use ammunition storage in a bustle rack attached to the turret with access doors and blow off panels to reduce crew injury in the event of a strike, as this acts to increase vehicle cross-section and makes a strike more likely. But due to too many incidences involving crew being killed by ammunition stored in the turret or vehicle chassis being set off as secondary explosions by threat overmatch penetration (i.e., ammo cooking-off), more modern Russian tanks have come to employ bustle rack ammunition stowage. The history of Soviet/Russian Armored vehicle development, and key characteristics of Soviet style MBTs, is reviewed. Following World War I the major powers recognized the need to develop armored vehicles capable of mobility, firepower and protection (survivability). While England and France took the early initiative in designing armored vehicles, each other major power quickly copied their basic designs. Each would henceforth develop their own unique style of armored vehicle, evolving the process along their own design philosophy. By the 1930s both Germany and the USSR significantly outpaced the English and French development and took the forefront in armor design. In fact, through a secret pact, Germany and Russia were actually working together to develop innovative tank technologies, design concepts and battlefield tactics employing their newly developed weapons. The initial armored vehicles designed by all of the major nations during the interwar period tended to be light and were designed with a focus on being able to support infantry. However these designs soon evolved into heavy infantry support vehicles, large enough and with sufficient armor to protect them against field guns and small arms fire. But these early ‘tanks’ lacked large weapons, preferring to integrate machine guns and small calibre cannon suitable for engaging infantry. Many of these weapons were mounted in turrets, or even multiple turrets, providing the ability to fire at infantry in many directions simultaneously. The vehicles were designed to breach the trenches that defined World War I and hence their design did not emphasize mobility or speed. The tanks were meant to accompany the infantry and so only need to move as quickly as infantry, and over ground infantry would advance over. It was concluded that tanks would need to engage other tanks, just as aircraft were required be able to counter other aircraft. To optimize the tank in this new role is was determined that a single turret with the largest possible gun would prove most decisive. Therefore the ‘infantry support tank’ evolved into the true ‘combat tank’. Able to engage other armored vehicle and soft-skinned vehicles, the tanks maintained a heavy presence of machine guns, typically mounted in the turret and hull, to still meet the need to defeat opposing infantry. Eventually these vehicles developed into the wide range of light, medium and heavy tanks that saw combat during World War II. Each was principally designed to engage and destroy other tanks and armored vehicles. Infantry ceased to be the main force factor on the battlefield. The tank battalions now held that honor. All of these tanks possessed reasonable firepower, which continued to increase in calibre and projectile velocity as the war progressed. Medium tanks had reasonable protection and reasonable mobility. Light tanks had high mobility but low protection, being designed to get a tank into the fight quickly, providing a tactical advantage. Heavy tanks had heavy protection and large calibre guns, but were slow and thereby more effective in defensive or long-range bombardment roles. The Russians borrowed ideas from both the US and French tank designs. They were quick to employ the US developed Christie suspension system, which was superior to the then prevalent leaf spring approach. They also adopted the French notion of casting turrets, reducing cost and increasing productivity. Before WWII, and during the early stages of that war, turrets and hulls of most tanks tended to be fabricated from riveted plate, so casting also improved protection levels (rivets tended to fail when struck with a shell), and yet was inexpensive compared to the newly emerging field of welding. The first extensively fabricated Soviet tank with a cast turret was the ubiquitous T-34 medium tank. Eventually, as welding processes were improved, as higher hardness steels were developed that could only be fabricated as flat plate, the advantage of cast rounded turrets was reduced, though the Russians tended to prefer this approach on many of their platforms until relatively modern times. In addition to the well-known T-34, the Soviets also developed a wide range of other highly effective tanks and armored vehicles throughout the war, including the heavy Joseph Stalin (JS or IS) series, heavily armored and powerful but lethargic anti-tank field guns, such as the KV-2, and lightly armored but mobile and well-armed Cavalry vehicles. There were also ‘tank killers’ which had the gun placed in the hull rather than on a rotating turret, which reduced tactical flexibility but also significantly reduced cost. Despite the wide range of tank types explored during the war, the Russian experiences during WWII convinced them, as the war also convinced Western powers, that the optimal approach to tank design was a vehicle with good armor, a heavy gun, and effective mobility. This aligned with the medium tank approach rather than the under-armored light tank or the excessively cumbersome heavy tank. This realisation led the way to the development in the post-war period of the modern concept of the Main Battle Tank (MBT). The first Soviet designed Main Battle Tank was the T-54/55. The first proto-type of this revolutionary vehicle was actually produced just at the closing of World War II and marked a significant leap in tank design. The overall tank appearance, and many of the progressive concepts introduced, continue to the core to Soviet MBTs still being produced to this day. The low profile of the T-54/55 series of tanks and the small rounded turret are distinctive Soviet design characteristic. With up to 100,000 of these vehicles built it has the status of being the most manufactured tank in history. Supplied in large numbers by the Soviets to their client states the vehicle proved its capabilities in numerous conflicts throughout the latter half of the 21st Century. Subsequently sold to non-Warsaw pact nations the T-54/55 currently remains in operation with armies of many third world nations to this day. Equipped with a powerful 100 mm rifled gun, more powerful than other tanks of the time, gun stabilization was also introduced with the T-55 upgrade, further improving firing cycle time and accuracy. The hull and turret were well armored compared to other contemporary vehicles as well. The Turret was manufactured from approximately 8” (205 mm) of cast armored steel on the front and 5” (130 mm) on the sides, and the hull armor consists of 4” (100 mm) of steel angled at 60° in the frontal arc and 3” of steel (80 mm) on the sides at 0° obliquity. The vehicles were of a relatively simple and low cost design, while being tough and functionally effective. This is another key characteristic of Russian design that evolved from the brutality of their experiences during WWII. Rather than make complex tanks which were slow and costly to build, as did the Germans, the Soviets recognized that most tanks covered minimal ground and had a short life expectancy once battle commenced. Therefore they put emphasis on designing tanks of which huge numbers could be produced quickly and inexpensively, relying on volume over sophistication to overwhelm an enemy. By maintaining a smaller sized vehicle with a small turret, the vehicle was also designed to offer as small of a target as possible to enemy tanks and anti-tank guns. Keeping the vehicle relatively light compared to the Western vehicles also meant that mobility was kept high, both on the move and for transportation by rail or truck. The tracks are wide and spaced far apart, improving cross-country mobility by keeping the footprint (i.e., ground pressure exerted by the vehicle) low. These lighter MBTs could also pass over bridges which could not support the weight of heavier Western MBTs. Low overall vehicle weight is another key Soviet design characteristics that continued to be seen in subsequent and contemporary Soviet MBTs. The T-54/T-55 performed well but had a number of negative features. The vehicles had a very cramped interior resulting from the effort to maintain a small silhouette. This compelled the Soviets to require smaller individuals as tank crewman. Another consequence of the cramped interior was this this limited the range of motion and speed at which the crewman could adjust controls and operate equipment. The most major consequence of this was restricting the rate at which ammunition could be reloaded. The ammunition was stored in the chassis and not protected, and so secondary detonations remained an issue. Oddly, the turret floor of the T-54 was not designed to rotate with the turret. As with the T-34, this forced the cramped crew to have to shuffle about as they rotated the turret. This had an impact on firing response time and accuracy. This however was corrected in the T-55 and all subsequent MBTs in which the turret basket floor is suspended from the turret so that the gunner and commander position remains synchronized with the turret orientation. The T-55 primarily fired HEAT rounds to engage targets. At the time nations believed that the newly developed round would dominate the future battlefield. America even developed a 152 mm gun that could only fire HEAT rounds for one of its MBT variants. Both the Soviets and the British (Chobham armor) however developed ceramic armor systems, which performed very well against HEAT rounds compared to conventional armored steel. Therefore the quickly evolving kinetic energy based long-rod penetrators actually became the dominant anti-tank tank round. HEAT rounds do not require a high muzzle velocity but long-rod penetrators do. Therefore the Russians, as with the Western nations, had to abandon large bored low velocity guns and replaced them with high velocity guns, requiring stronger barrels and breach mechanism. The T-55 therefore also suffered from employing a barrel type and primary anti-tank round that were soon to become obsolete. Despite the relative success of the T-55 platform, the introduction of this intimidating tank resulted in Western powers developing advanced MBTs of their own. The development of the American M60 MBT was a direct response to the appearance of the T-55. This in turn compelled the Soviets to continue developing their own technologies. The next major advancement in Soviet MBT tank technology was the T-62. The T-62 was essentially an evolution of the T-55, continuing to utilize many of the same components and systems. The main weapon calibre was increased from 100 mm to 115 mm. This was a smoothbore weapon, rather than rifled, and it is the first instance of a smoothbore barrel being used on a MBT. Despite the larger gun the rounded cast armored steel turret of the T-62 was actually smaller than that used on the T-55. Introduced into service in 1961, the vehicles continued to be manufactured until 1975. The T-62 however was found to have a number of short comings, as identified during its deployment by Arab allies in the Yom-Kippur war with Israel. The vehicle was not able to perform adequately against its contemporary Western MBTs – though much of this in retrospect was probably due more so to the superior training of the Israel tank crewmen compared to their Arab counterparts than to the tank itself. Regardless, the T-62 was quickly further evolved into the more commonly employed T-64. Where the T-64 appeared similar to the T-62, it represented a significant change in Soviet design. The T-62 maintained the concept of a simple and inexpensive vehicle. While the T-64, though similar in appearance to the T-62, took the radical step of introducing more complex and expensive systems in an effort to compete with the sophisticated Western MBTs. The lengthened main weapon was designed with high strength steel to accommodate the high barrel pressures required to attain the significant muzzle velocity of the kinetic energy based ammunition. The T-64 was lengthened to further decrease ground pressure through the addition of another track wheel, increasing from 5 for the T-62 to 6 for the T-64. Another revolutionary and characteristic feature of Soviet tank design was also introduced with the T-64. This is the integrated ammunition auto-loading system. The T-64 was the first full production tank to ever incorporate such a system and it resulting in a significant increase in main weapon reload time compared to manual loading in the cramped interior. Reload times with the auto-loader became comparable to Western MBTs, which still relied on manual loading of ammunition. Incorporation of the auto-loader also removed the loader, and so reduced crews from 4 to 3, as well as reduced the overall vehicle weight. In 1967 the main weapon of the T-64 was further enhanced to a 125 mm smoothbore. Primarily designed to fire long-rod penetrators and HEAT rounds, an anti-tank missile was introduced in 1976 that could also be fired from the gun. These two revolutionary enhancements preceded Western developments by many years. Western powers continued to rely on their 105 mm rifled gun until development of relatively modern tanks, focusing on enhancing the design of the long-rod penetrators to improve their lethality rather than increase the gun bore (Implementing the bigger 125 mm was partly driven by the inability of the Soviets to adequately evolve their own long-rod penetrator designs). The original M1 Abrams in fact maintained the 105 mm gun and was only upgraded to the German 120 mm smoothbore with the M1A1 variant, when it was recognized that both a larger round and a better designed round would be necessary to defeat ever evolving Soviet armor. The next significant Soviet MBT was the T-72, introduced in 1970. The T-72 returned to the KISS (keep it simple stupid) principle used with the T-55 and T-62. While the complexities of the T-64 design were in turn used to develop the relatively sophisticated T-80. Though less widely built than the T-72 the T-80 introduced a number of progressive features, mimicking many of the better aspects of Western designs. Essentially, the Soviets were trying to figure out if KISS was adequate in a modern high-tech environment or if they would be compelled to produce complex but expensive vehicles to be able to compete with their Western competition. The Soviets do not have the large budgets of many Western nations and so need to be more conscientious of costs per unit when it comes to military equipment. 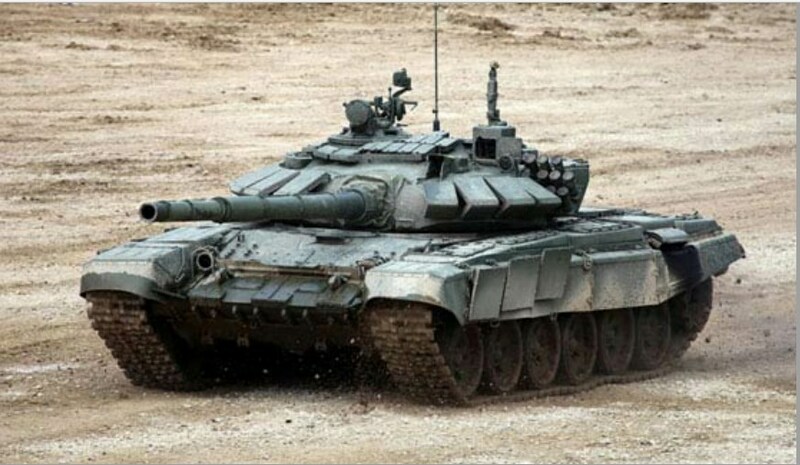 Lessons learned from combat experiences with the T-72 and the T-80 would in turn be used as the basis for development of the modern Russian T-90, a powerful lightweight vehicle that balances design simplicity with high-tech equipment. All three of these MBTs continued to employ the successful ammunition auto-loader, and therefore each still only requires a crew of 3 to operate the vehicle. Despite the introduction of ceramic and reactive armor, active protection systems and more advanced fire control systems, each of these MBTs all maintain many of the same key features typical of Soviet design, including the relatively small overall vehicle size and the small rounded turrets, with the corresponding overall light vehicle weight and high mobility performance as compared to their Western counterparts. Overall, Soviet vehicle design conventions, and the relative advantages and drawbacks of these approaches, are summarized below. The hull size of the T-34 and every subsequent MBT is relatively small compared to Western styled vehicles in an effort to improve mobility and reduce the vehicle silhouette. This places significant restrictions on the range of motion for the crew and often necessitates small sized crew members for some crew positions. As the weight of the vehicle is reduced through the smaller vehicle size, the power required to move the vehicle is therefore correspondingly reduced. Therefore a lower weight engine can be used, also lowering fuel consumption. But engine size does not decrease linearly with weight and therefore consumes more of the available space inside the vehicle. This acts to even further restrict the space available for the crew. The small circular turret further aggravates the restriction on space availability for the gunner and commander, and loader when applicable. This space restriction not only reduced the rate at which the crews could respond to threats, put tended to exhaust the crews, further reducing their overall performance. Exhausted crews who were unable to move freely tended to reload more slowly, take longer to aim the weapon and were less likely to hit their intended target than Western crewed tanks. Recognizing that Western vehicles were often reloaded at 2 to 3 times the rate of their own, the autoloader was introduced on the T-64. Early versions of this did not perform well, and even modern versions are prone to jamming. Once jammed, the gun cannot be used until the mechanism is cleared and re-set. This is a slow and cumbersome process within an already cramped vehicle interior. The smaller chassis and turret size also reduced the number of main weapon rounds that the vehicle could carry, resulting in a greater potential of running out of ammunition through a battle. This problem was further aggravated when the weapon size was increased from 100 mm to 115 mm, and then to 125 mm. The larger the rounds, the fewer that can be carried in the same available space. The space taken up by the auto-loader also reduces the number of rounds that can be carried, and only a limited number of rounds fit in the auto-loader carousel. Once this ammunition is depleted, rounds must be manually loaded. In the cramped space and with the auto-loading mechanism in the loading path, this is a very slow process. A small turret also results in a limited gun depression angle. This reduced the ability of the vehicle to defend itself against attacking infantry and while operating on a downward facing slope or in a ‘hull down position’, which is when the hull is concealed behind a barrier to improve protection and make the vehicle more difficult to hit. The small vehicle size also meant that any ‘overmatch event’, which is to say when an incoming threat defeats the armor and penetrates the vehicle, would result in a higher probability of the penetrating fragments striking stored fuel or ammunition when compared with Western vehicles. This would typically result in ammo ‘cooking off’ and secondary combustion events, which in the cramped space would quickly kill the crew and destroy the vehicle. Until recently the Soviets have made little effort to isolate the vehicle fuel and ammunition from the crew as do Western designs. Soviet military philosophy stressed cost effective designs over crew survivability. A high value is placed on human life in Western societies. Russian government tends to regard humans as just one more expendable resource. The equipment in the vehicle was more compactly packaged compared to Western vehicles and therefore overmatch events would also have a higher probably of damaging critical components of the communications, electrical, hydraulic and main weapon operating systems, resulting in a loss of functionality of the vehicle and a greater potential of being taken out of the battle. Soviet guns were typically of a larger calibre than their Western counterparts. The larger gun however was necessary to off-set the poorer performance of Soviet long-rod penetrators, the performance of which suffered due to low quality manufacturing practises. Soviet main weapons also tend to provide inferior aiming capabilities compared to Western vehicles. The comparatively poor accuracy is a reflection of the lower fabrication quality of the gun barrel and more significantly is due to the lower sophistication of Soviet designed Computerized Fire Control Systems. Soviet armor tends to be on par with Western armor and often even leads in introducing new concepts. The Soviets were the first to introduce ceramic armor, reactive armor, and Active Protection Systems, largely driving the development in Western nations of improved ammunition and armor systems. Soviets tend to layer their armor systems to produce an overall lighter armor solution, keeping vehicle weight down. However, because of their lesser attention to crew survivability, Soviet tanks are prone to having weak spots in an effort to reduce weight. Though the location of these weak spots are not evident, insurgents during the Chechnya Wars were quite successful through trial and error in finding these locations on T-80s and exploiting the weakness to destroy the vehicles. The Soviet experience during WWII caused them to emphasize quantity over quality. The Soviets have typically fielded far more tanks than were in operation with all other countries in the world combined. They may not be built to the high design and manufacturing standards of the Western world, but they are not poorly built. This was much the same as how Soviet tanks compared to German tanks during WWII. Willing to take higher casualties than Western nations, the small size of Soviet tanks and their utilization of less expensive parts permitted them to overwhelm their enemy with excessive force. Ultimately the quantity of fielded Soviet tanks by 1943 made their victory inevitable. The Soviets/Russians continued to emphasize quantity over quality. Despite this, they are also often very innovative in their designs and progressive in their armored warfare theory.